Elephant redirects here. For the vehicle introduced in Halo Wars, see M312 Elephant. For the civilian version, see Olifant. The M313 Heavy Recovery Vehicle, commonly known as the Elephant, is a heavy UNSC Marine Corps Mobile Assault, Support, and Recovery Platform. Sometimes referred to as the Behemoth-class Troop Transport, the vehicle is one of the largest ground vehicles employed by the UNSC for ground-based operations, though since the end of the Human-Covenant War in 2552 it has been surpassed in size by the M510 Mammoth. Designed and manufactured by JOTUN Heavy Industries, the Elephants were initially used in the utility and farming industries during the early colonial expansion periods. 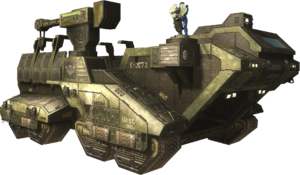 After several decades serving in the civilian market, JOTUN was contracted by the UNSC to develop the Elephants and build them as armored repair and recovery vehicles. As time has progressed, the Elephant has been modified into several variants and upgrades, though the Elephant's versatility remains unchanged. The size of the Elephant in comparison to other vehicles and a real Elephant. The Elephant is a three-level vehicle--almost a mobile base--with the bottom level acting as a respawn area in multiplayer that opens out into the rear cargo tray. The second level is a walkway/gantry accessed by a ramp that goes around the inside edges of the cargo bay and leads to the driver's cabin. This level is also where one can find the optional AIE-486H Heavy Machine Guns. The third level is small and elevated, situated beside the cockpit. This is where the main armament is found (in the form of an M41 Vulcan). Like the M312 Elephant, the M313 Elephant is designed to safely transport troops, equipment and light vehicles to and from the frontlines. However unlike its previous model, the M313 Elephant features only one M41 Light Anti-Aircraft Gun as its armament, though this can be improved with two additional AIE-486H Heavy Machine Guns. It also features a crane, numerous firing ports and elevated positions for defending it. Its chassis is also as wide as it is high, providing stability. The Elephant houses a Mongoose in its lower bay, and can be made to hold up to an additional of three Mongooses in the front, as well as two in the back with two Warthogs. The vehicle's rear bay lacks the protective armor that is available on the M312 Elephant, thus increasing the vulnerability of its carriage. The Olifant is a civilian version of the vehicle designed for the purposes of waste management. New Mombasa Waste Management owned and operated these vehicles, using them as garbage trucks. This model of Elephant appears exclusively in Halo 3's multiplayer map Sandtrap, located at each end of the map. It is completely invincible, and open-topped, unlike its counterpart in Halo Wars. The open roof is probably due to the fact that it is a service and repair station, not a troop carrier. Inside the Elephant is a large screen which contains information on a Mongoose and the Sandtrap's atmosphere, although it is incredibly hard to read. While the vehicle itself cannot be destroyed, its slow speed and lack of armor for gunners render them quite vulnerable. Killing the driver must be attempted from behind, ideally in a vehicle like a Banshee. In objective-based games, the elephant also serves as a mobile bomb plant/spawn site and flag stand. In Halo: Spartan Strike, the Elephant is armed with twin cannon and twin missile pods. In Mission A-4, a Zealot Elite hijacks an Elephant, destroying the vehicle from inside out to retrieve the Conduit. E-2073 46833-S - UNSC Elephant stationed on Sandtrap (it is interesting to note that both Elephants on the level Sandtrap are almost completely identical, including having the same identification numbers). They both have nicknames: one is called the "Behemoth", while the other is called the "Leviathan", and they both have different insignias painted on their sides. Another means of identification is that below the M41 turret at the front is the number 3 for the Behemoth and a number 5 for the Leviathan, also on the Leviathan is another number 5 on one of the panels at the top of the outer left hand side of the cargo tray. An elephant is a large, grey mammal native to Africa and southern Asia, in keeping with the UNSC's tradition of naming ground-based vehicles after real animals, with the exceptions of the Cyclops and Gremlin, which are named after mythical creatures. If the player goes to the bottom level of the Elephant, there is a screen which gives details about the vehicle's specifications, as well as information on a Mongoose and the Sandtrap's atmosphere, although it is incredibly hard to read. There are phrases visible such as Mobile Assault Support and Recovery Platform Statistics and Environmental Analysts. It is interesting to note that it says there are two mobile turrets (that can be ripped off) while there is actually only one. Perhaps one was removed for balance issues as there is a vacant spot opposite the one that is present. The M313 Heavy Recovering Vehicle's name is a 7 reference, as 3+1+3=7. The Elephant is the only drivable vehicle that can have turrets placed on it without them moving/falling when the vehicle drives off. If a player (in Forge) places a crate or two in the cargo bay of the Elephant, places a turret on top of them and then deletes the crates, then players can drive the Elephant with the turret keeping place over the Elephant. Gears of War 2's Derrick bears a striking resembalance to the Elephant, most likely due to the fact that both are heavy recovery vehicles. Both in turn bear a slight resemblance to the Jawa Sandcrawler from Star Wars. 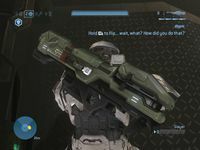 The windshield in front of the driver is capable of protecting him from any kind of attack (except Spartan Lasers) without damage; this is probably a balancing action, because the Elephant is a very slow vehicle. In addition, the driver can only be attacked from the back; all other sides are completely protected. The Elephant was removed from Sand Tarp, a variant of "Sandtrap", by Bungie. On the left-hand side of the Red Team's Elephant there is spray-painted graffiti with text that reads "BEHEMOTH" and a red cartoon picture of a woolly mammoth. On the Blue Team's Elephant it says "LEVIATHAN" and has a picture of a blue, whale-like sea creature sporting a mean grimace and wearing a comically tiny golden crown. The Behemoth and Leviathan are two scriptural creatures that are enormous in stature and girth. A player flips an Elephant, initiating the Easter Egg. If by some chance the player does manage to flip over an Elephant, the usual "Hold RB to flip [vehicle name]" script dialog is replaced with "Hold RB to flip...wait, what? How did you do that? ", referencing the fact that it is the biggest vehicle in the game and that it is seemingly impossible for it to be flipped. For more information, see Elephant Flipping. There are many methods of achieving the flight of an Elephant on the multiplayer map Sandtrap in Halo 3. The first is the well-known technique of filling the hull with explosives--set to instant respawn--and setting them off. This is a trial and error method, and achieves minimal Elephant flight, in which the player lacks control of the flight and trajectory of the vehicle. For more, see Flying Elephant. If you place a Covenant hover vehicle like a Type-32 Ghost or Prowler on top of the cockpit, and then drive to the center of the Elephant, the vehicle will stay floating as if there were an invisible floor on top of the Elephant. This same glitch (or a similar one) is present in Halo 2, although with the Scarab instead of the Elephant. Lag from standbying can allow a player to directly manipulate an Elephant in Forge. In some cases, lag on map variants with a lot of Elephants can have the same effect. Leviathan insignia on the Blue Team's Elephant. Behemoth insignia on the Red Team's Elephant. An unoccupied Elephant in Halo 3. Another angle of the Elephant. A profile view of the Elephant from Halo 3. The rear of the Elephant, showing the cargo ramp leading to the driver's cabin. An Elephant in one of Halo: Spartan Assault's mission briefings.